Join us for The Pain Management Workshop. During this enjoyable workshop, you will learn some useful techniques to take control of your pain and learn to lower your pain levels. The aim of this Pain Management Workshop is to teach you some wonderful skills for pain management. Using the power of Self-Hypnosis and Emotion Freedom Technique, you can start to take control of your pain, emotions and feelings. With a little practice of these techniques, you will quickly be able to reduce pain, anxiety and stress down to a comfortable level, feeling relaxed and in control. 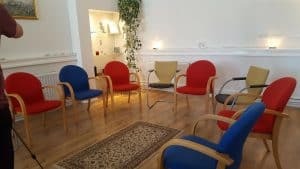 is part of the regular Wednesday Workshop, organised by Newcastle Hypnotherapy and held at The Vault, Wallsend on the 3rd of October. Starting at 7.30 pm, attendance is by advance booking only and just £8.50 per person to cover costs. Spaces are limited and strictly booked on a first come, first served basis. You can book your place below while spaces are still available. How Do I Book For The Pain Management Workshop? To book your place simply click on the button below and pay by card or PayPal. Want To Learn About The Other Events? Complete your details below and join the events newsletter. We are GDPR compliant and will only use your details to send you updates. The Wednesday Workshop is a non-profit event. Once you have booked your place you can move your place to someone else by contacting We do not offer refunds. Attendance is strictly by advance booking. Please arrive on time, as directed in the confirmation email. Questions and Answers – The Pain Management Workshop. Where and when is this Pain Management Workshop? This event is part of the Wednesday Workshop at The Vault Creative Wellbeing Centre, Station Road, Wallsend, Newcastle upon Tyne. It is held on the 3rd of October 2018, starting at 7.30pm until 9.30pm. £8.50 per person with booking only in advance. This event is organised by Newcastle Hypnotherapy. Once you have booked your place, an email will be sent with directions and useful information for the evening. Will this help with Chronic Pain? The techniques we will use should help will all sorts of physical and emotional pain. If you have a serious pain problem you can gain greater benefit with a private session to focus on your individual needs. Call Mark on Call 07568 455 809 for more information or we can discuss private sessions and programs at this event. How successful is Hypnosis for Pain Management? Our clients find Hypnosis and Self-hypnosis very effective with pain management and for all sorts of pain. During this workshop, we will use Self-hypnosis and EFT as successful techniques to control your pain. Can I just turn up in the evening to attend? As we have limited spaces we ask everyone to book their place in advance. This saves time and effort on the evening to focus on the topic. Therefore, you must book in advance if you wish to attend. If you have any questions that are not answered here, simply Contact Us. Do you run private sessions for Pain Management? Yes we run a dedicated Pain Management Hypnosis Program for those wanting faster results with pain issues. You can learn more about the Pain Management Hypnosis Program here. The Vault Creative Wellness Centre.